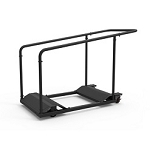 These folding table trucks provides neat storage and transportation of 4', 5', 6? and 8'. 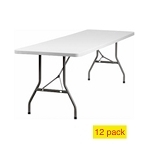 Can be used for Plastic or Laminate Tables that fold and are laid flat, stackable up to 12 table high. Rolls on 4 castors: 2 swivel and 2 stationary. Built with tubular handle providing stability and ease of handling. Constructed of powder coated steel; color brown. 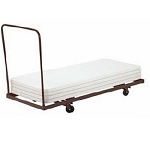 These storage carts are perfect for NPS table models BT-3072, BT-3096 and BT1872. Storage capacity may differ with other brands of tables. 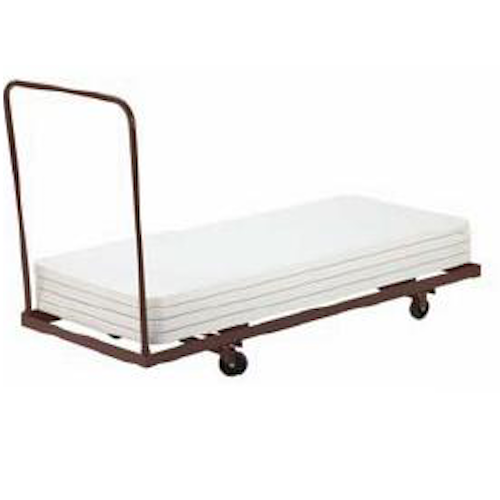 This Table Dolly is made in the U.S.A.
Q: How easy are these table carts to assemble? Will I need help to put it together? Fast Shipping: Orders for the National Public Seating DY3096 generally leave the warehouse within 2-4 business days. Dimensions: 91" x 31" x 9"